Among the Usual Days: Just how did our foremothers do their cooking? Just how did our foremothers do their cooking? Most often when we visit a small town museum we see an iron cook stove. So we are inclined to imagine that folks had them since the first European settlers arrived in America. But the truth of it is that people cooked in their fireplace long before cook stoves came along. Cooking and heating fireplaces had been used since the middle ages. It was a few centuries before any improvements were made. 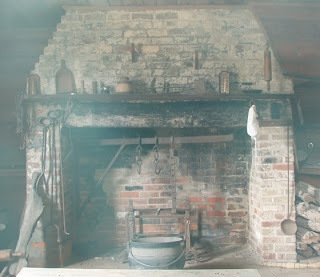 Some of you may have seen a fireplace used for cooking in a photo or a museum display. Often several fireplace tools and several pieces of cookware are shown. But the truth of it is that most early Americans cooked with just a few items. Perhaps a pot hook, a kettle and a ladle. An area of embers might provide heat to a small bake oven or to a make shift oven made with an overturned kettle. So when the cook did stove come along? It wasn’t until about 1820 that efficient stoves were available making it a useful appliance home use. Though we’d like to think that this invention came about to make life a bit easier for the women of the house but the real appeal of the cook stove was that it took far less wood than a fireplace. While wood was plentiful for many of the early settlers in America as time passed people had to go further and further from home to get enough wood to keep their family warm and to cook their food. We make a big mistake if we think that this means everyone had a cook stove by the 1830s or 40s. New technology didn’t spread like it does now. First the wealthy had such improvements to their homes. Gradually more and more other people were able to afford them. Also things spread slowly in terms of distance. Transportation was slow so we find that the stove along with other inventions took time to spread from the northeast to the south and the west. 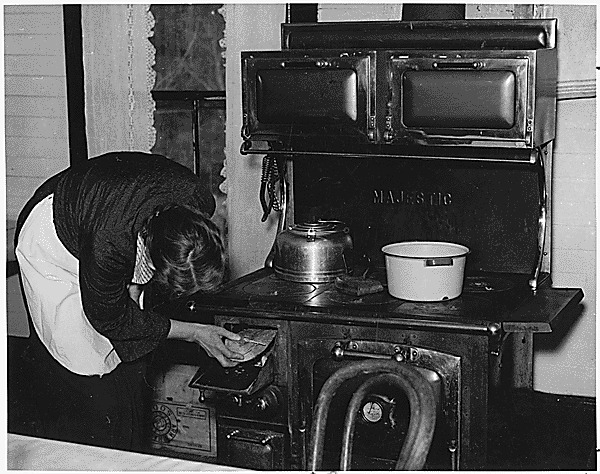 Especially in populated regions by the mid 1800s a cast iron stove was considered a necessity in a “modern” kitchen. These stoves burned either wood or coal. 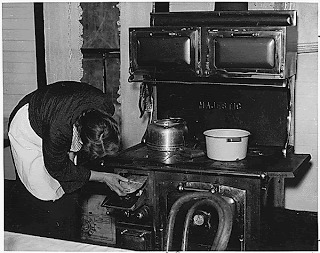 Even gas stoves were available but they lacked the safety features we have today so they were not that common yet. In the 1900s more and more American obtained electricity and by 1915 most middle class homes had electric appliances. But that doesn’t mean there weren’t a lot of folks still using wood or coal stoves. Both means and availability still affected who had modern stoves. So next time you pop dinner into the microwave think about your ancestors who would never have dreamed of such an invention.